As a blogger you may be completely unaware you have lost touch with your readers. Some bloggers are continually churning out content on a hope and a prayer that the search engines will find the content and generate highly interested people to their blog post content. Sorry to tell you but that’s you then you’re failing quickly as a blogger. Have you noticed the amount and type of comments you’re receiving have changed? Are you indeed not getting any comments at all these days? As bloggers, we should always be striving to create the most relevant content we can for our target audience. However, do you know who your target audience is? Are we really connecting with them? Are we communicating in a way where the real meaning our words are conveyed? Let me start by sharing an incident we just had that really brought home the essential elements of successful communication. We live in a remote little Thai village and 2 days ago in the middle of a very stormy night whilst driving on a country dirt road I all of a sudden heard a screeching noise coming from under the car. Being a complete mechanical dunce and still some 200kms away from home, I pulled over to the side of the little road and waited for the storm to ease. Finally, with some help from a passing motorist, I discovered that the drive-shaft on our car had collapsed. Long story short – after sleeping in the car overnight, I finally made contact with the Honda dealers who organized for the car to be transported for repairs. And this is where the communication problem came into play. Yes, I can speak passable Thai but I failed to pick up the nuances in the words being told to me by the mechanics. Not wanting to worry or upset me they told me that the car could easily and quickly be fixed and they just had to wait for some parts. What they failed to communicate to me was that the delivery of the parts could be 7-10 days, and even then they were not sure how long it would take them to complete the repairs AND the cost was going to be HUGE! And that was with face-to-face communication – the best we can ever hope for! In our virtual world of blogging, technology has completely changed the way we communicate on a regular basis. It’s so easy for us to succumb to the speed and convenience of technology with things like chat and share functions in social media or on skype. Communication is critical for entrepreneurs and I’d suggest it’s almost impossible to build any business if you don’t communicate. But it’s HOW you communicate that will determine if you succeed or fail in your online (and offline) business. So let me ask you again. Have you lost touch with your online community? The problem with our virtual online communication is that we lose some essential elements of our communication potential. With words alone, it’s virtually impossible to fully interpret emotions and vocal tones except for maybe the very best writers. In addition, 2-way eye contact is completely missing even with the use of “live video” and the ability to read body language has been completely removed. It’s commonly accepted that only 7% of our communication is provided by verbal or written word. 38% of our communication is based on speech/tone/pitch factors. In other words (excuse the pun), 55% of all communications is based on non-verbal body language. Elements like our personality, excitement, passion and attentiveness can’t be fully interpreted online. The same thing goes for relationships. Many of us are fully involved in creating and building relationships online within our niches and a lot of this is done via email and social media chatting. But are we really communicating the right messages? Are we indeed sending mixed messages? Without the power of face-to-face communication, words can very easily be misinterpreted online and in some cases result in lost touch with your readers . Here’s a classic case of misinterpretation with text messaging using phones that auto-correct text. Our facial expressions, physical gestures and the emotional tone of our voice alter the meaning of our words. And this is why it’s difficult to express ourselves fully and with authenticity in an email, text chat or even on Skype. As bloggers, we need to be aware that just creating and providing valuable, relevant content is not enough to become a profitable blogger. Just look at your last blog post, video, social media chat or even the last email message you sent out. Did your content also generate engagement? I strongly support the concept of providing valuable information. However, you must ensure you are really communicating with your target audience if you want to survive online. Just providing information – no matter how valuable it is – will rarely if ever build any relationships online. I am suggesting you always strive to be engaging. In other words use a variety of communication options apart from the written word. Utilize things like video and audio to share your message. In addition, be completely open with people, be talking with them about what you do, how you do it and why you do it. Always be showing your target audience not only that you understand them but that you are prepared to engage with them. The more you engage with people the more relationships you will build, the faster your business will grow and the more money you will make. It’s that simple or is it? The virtual communication platforms we all use can and do cause issues for all of us. For example, a friendly e-mail can be interpreted as sarcastic or even an innocent Tweet can be perceived as inflammatory. Communication issues like these can cause big problems for our online businesses, and could easily lead to losing prospects, customers, and revenues. And yes we all make communication mistakes at one time or another. But you can optimize your communication potential, avoid the issues that arise if you lost touch with your readers and at the same time, protect your online reputation by always taking into consideration the needs of your target audience. So Have You Lost Touch with YOUR Readers? Here some simple steps to take to help if you have lost touch with your readers. Prepare each piece of communication carefully and make sure you are clear about the actual purpose of your message. Always give yourself time to check your post, email or presentation before you send it. Is your real message clear? Never assume that your readers have fully understood your message. In your blog posts or your emails encourage people to respond with questions or simply reply and tell you that they don’t understand what you’re sharing. The result of having a focus on this specific issue and encouraging feedback from my readers and subscribers has been a significant increase in the number of questions left in my blog comments plus it has also helped improve my email open-rates. And most importantly, keep in mind that all communications are a two-way process. Have a mindset that is ready and willing to answer questions from your blog readers and always pay attention to what your audience has to say. Communicate in Stories. Story-telling has been a key communication strategy for me with my posts and emails and this form of communication has started to really work for me. People really respond and engage with stories and it’s not that hard to do. By simply taking lifestyle events like the car incident you can weave your message into a more engaging format and help avoid the scenario of having lost touch with your readers. TIPS: Search online for “feel good”, “amazing”, “inspirational” “motivational” or even “weird” short stories and let your imagination flow with how you can possibly segue into the real message you want to share with your readers or subscribers or viewers. If you get the chance check out on Amazon books for a book by Paul Smith called “Lead With a Story” – this classic book shows you how to craft business narratives that captivate, convince and inspire. And whatever you do, if you want to see how truly effective (and profitable) the story-telling of everyday events can be, then make sure you check out Ryan Biddulph’s “Blogging from Paradise” Ryan has been travelling the world for years whilst sharing with everyone his exploits and experiences in a story-telling format that is communication at it’s very best. 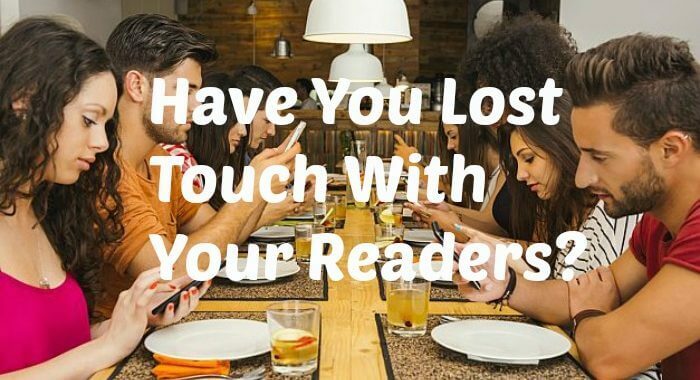 “Have you lost touch with your readers? Do you engage in the same way with your prospects, subscribers, and customers? What communication experiences can you share that shows the power of engagement? Please leave me your thoughts and feedback in your comments – I always reply and engage as much as possible.